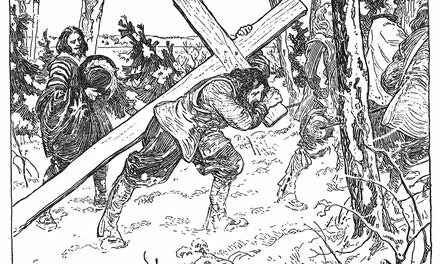 Montreal, to-day the largest city in the Dominion, was founded as a mission station in 1642 by a little band of pious devotees, who planted this outpost of the Christian faith in the heart of a savage, heathen world. A fort was built near the shore, low down in the present city, in the heart of what is now the wholesale and shipping district. Then, all was forest, broken only by the small clearing around the fort. Life in Ville-Marie, as they called Montreal then, was full of daily peril. 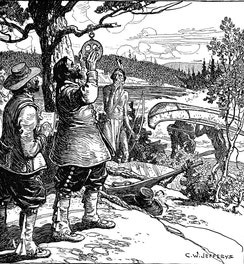 Iroquois lurked in the surrounding forest, falling upon wood-choppers and workers in the fields; on the river, their canoes hid among the reeds or under the treeclad anks to dash in swift pursuit of the solitary voyageur or fisherman. 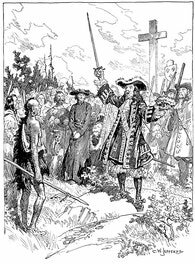 But their governor, Paul de Chomedy, Sieur de Maisonneuve, was an ideal leader for the crusading colonists. He was a soldier, in the prime of life, pious, brave, and self-sacrificing. But he was also prudent; he knew that the settlers were no match for the Indians in bush fighting, and he refused to allow them to venture in pursuit of their elusive foes. Constant watch was kept, but the fort's most efficient sentinel was a dog, named Pilotte, who, with her puppies, scouted the edge of the woods and barked a loud warning whenever she scented the presence of hidden Indians. Irritated by the continual ambuscade and siege, Maisonneuve's men clamoured to be led out against their enemies and taunted him with cowardice when he refused. At last, one day in March, 1644, Pilotte gave warning, and Maisonneuve granted their desire. He called for thirty men and led them to the attack. In the woods a swarm of Iroquois met them and shot at them from every side. The French fought stubbornly, but, at length, under the heavy fire, they began to fall back. 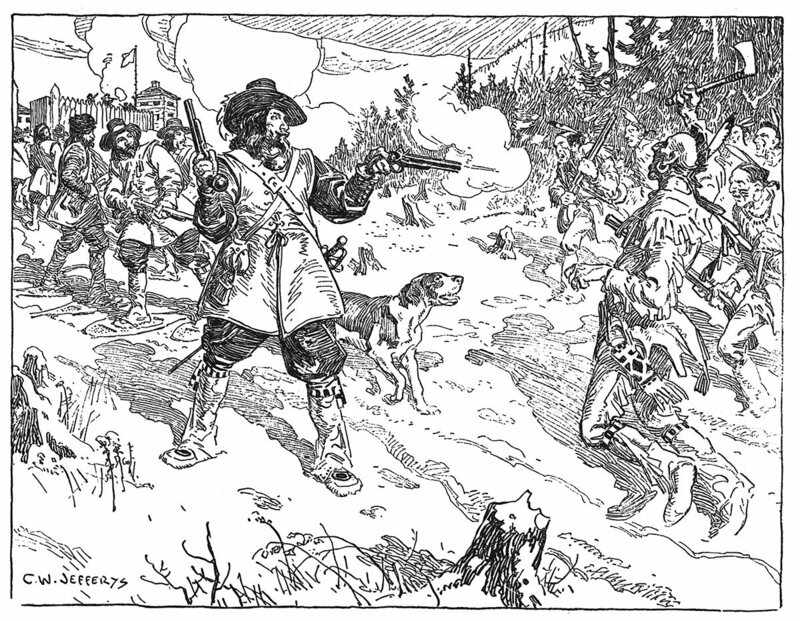 Maisonneuve, a pistol in each hand, fronted the Indians, who charged forward in pursuit. They might easily have shot him down; but they wished to take him alive and torture him as a trophy of their victory. Slowly he retreated, till, in sight of the gate of the fort, through which the French were crowding, the Iroquois chief dashed at Maisonneuve. He fired, but his pistol missed. The Indian dodged and rushed again. Maisonneuve fired his other pistol. The chief fell dead, and while his warriors rescued his body. Maisonneuve reached the gate, with Pilotte at his heels, still barking defiance at the Indians. The dog and her master had won the honours of the day. On the Place d'Armes, in the heart of the city of Montreal, near the spot where the fight took place, Hebert's magnificent monument to-day commemorates Maisonneuve's exploit. The picturesque figure of the governor crowns the pedestal, while in one of the groups which flank the base crouches the alert and faithful Pilotte. Life in Ville Marie was full of daily peril. Prowling Iroquois lurked in the surrounding forests, falling upon wood-choppers and workers in the small fields around the fort. Maisonneuve knew that the settlers were no match for the Indians in cunning bush fighting, and refused to allow them to venture in pursuit of their elusive foes. Constant watch was kept, but the fort's most efficient sentinel was a dog, named Pilotte, who, with her puppies, scouted the edge of the woods, and always barked a loud warning when she scented the presence of hidden Indians. Irritated by the continual ambuscade and siege, Maisonneuve's men clamoured to be led out against their enemies, and taunted their commander with cowardice. 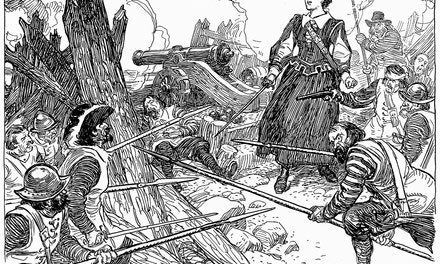 One day, in March, 1644, Pilotte gave warning, and Maisonneuve granted their desire. He called for thirty men, and led them out to the attack. In the woods a swarm of Iroquois met them, and shot at them from every side. The French fought stubbornly for a while, but at length, under the heavy fire, they began to fall back. Maisonneuve, a pistol in each hand, fronted the Indians, who charged forward in pursuit. They might easily have shot him down, but they wished to take him alive as a trophy of their victory. At last, in sight of the gate of the fort, through which the French were crowding, the Iroquois chief dashed at Maisonneuve. Maisonneuve fired, but his pistol missed. The Indian dodged, and rushed again. He fired his other pistol. The chief fell dead, and while his warriors rescued his body, Maisonneuve reached the gate of the fort, with Pilotte at his heels. The dog and her master won the honours of the day. On the Place d'Armes, in the heart of the city of Montreal, near the spot where the fight took place, to-day Hebert's magnificent monument commemorates Maisonneuve's heroic exploit. The picturesque figure of the Governor crowns the pedestal, while in one of the groups which flank the corners of the base crouches the alert and faithful Pilotte. Pierce, Lorne. Sieur de Maissonneuve. Toronto, Ryerson Press, 1926. 24 p. Illus. “What kind of pistol was used by Maisonneuve in old days?” In Toronto Star Weekly, June 14, 1930, p. ? Illus. Trueman, Bob. C.W. Jefferys: an alien astray in an inexplicable world. Willowdale, North York Historical Society, 2000. 14 p. Illus. In Doyle, Susan, ed. et al. History of illustration. New York, Fairchild Books, 2019 [sic, but published in 2018]. 554 p. Illus. shoots a Mohawk man who brandishes a tomahawk (Figure 18.29). fort on their land and was competing with them for the fur trade.